Elafonisos, Greece. Photo © Marina Vernicos. Cicadas chirping in the pine trees… azure blue waves crashing onto a sun-drenched beach… a warm, gentle breeze rocking a hammock… all sights and sounds that encapsulate Greece's easy-breezy summertime living. Despite the hardships the country has faced over almost the last decade, the essence of Greece is still ripe for the taking for anyone blessed enough to call it home… or their summer travel destination. It's true that if you look hard enough, every situation proves to have a silver lining which in the case of Greece, is its thriving creative scene which has resulted from a multitude of local designers taking a stand, and deciding to continue drawing inspiration from their homeland to create just like their talented ancestors did before them. Let’s face it, it's difficult to not be inspired if one's studio is located under the shadow of Athens' ancient Acropolis, or on a Greek island! This is why we've curated a great list of some of our favorite items that are sure to make summer extra special this year -- whether or not one is heading to a heady Cycladic island beach or the neighborhood swimming pool in Houston, TX. From the perfect pair of sandals, sun-inspired, gold jewelry, Greek cooking how-to's to the perfect platter to serve the yummy results on, all of these items sum up a little bit of Greek summer! 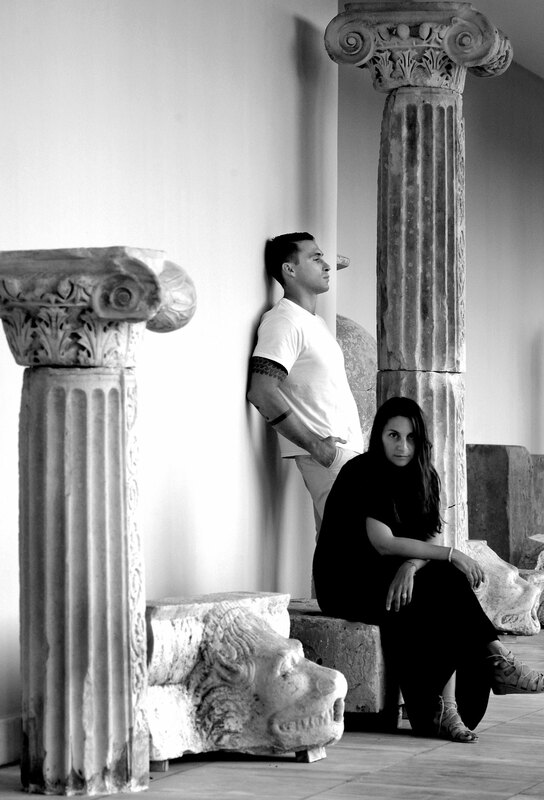 From the whitewashed stone streets of the Cyclades, to the pavements of Athens, people are talking about the new Greek label, Ergon Mykonos. 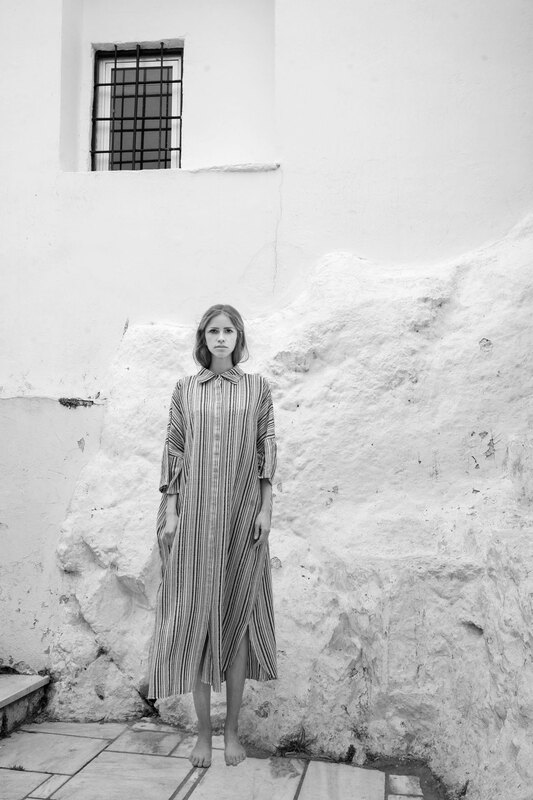 Featuring beautifully embroidered caftans, tunics, tops and skirts, as well as a fully customizable collection of covetable espadrilles, 'ergon's designs all bear witness to the traditional ingenuity, skills and craftsmanship of their homeland of Greece. Incorporating any of the collection's items into one's daily life are sure to impart it with a storytelling thread that is as ancient as Delos itself. The 'ergon Mykonos concept store began in order to highlight Greek heritage through a strong fusing of artisanship and art from all over Greece, while combining it with modernist pop references and designs. 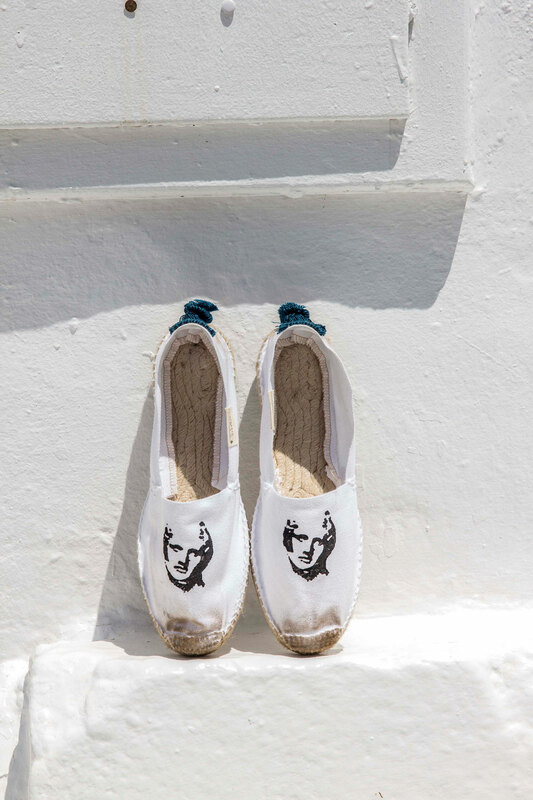 Customers are invited to become a part of this process through the shop's Design Lab, wherein one can customize their choice of espadrilles, sandals, bags or t-shirts with unique findings gathered from all corners of Greece. Now, that is definitely the perfect keepsake to take home from an amazing summer holiday! 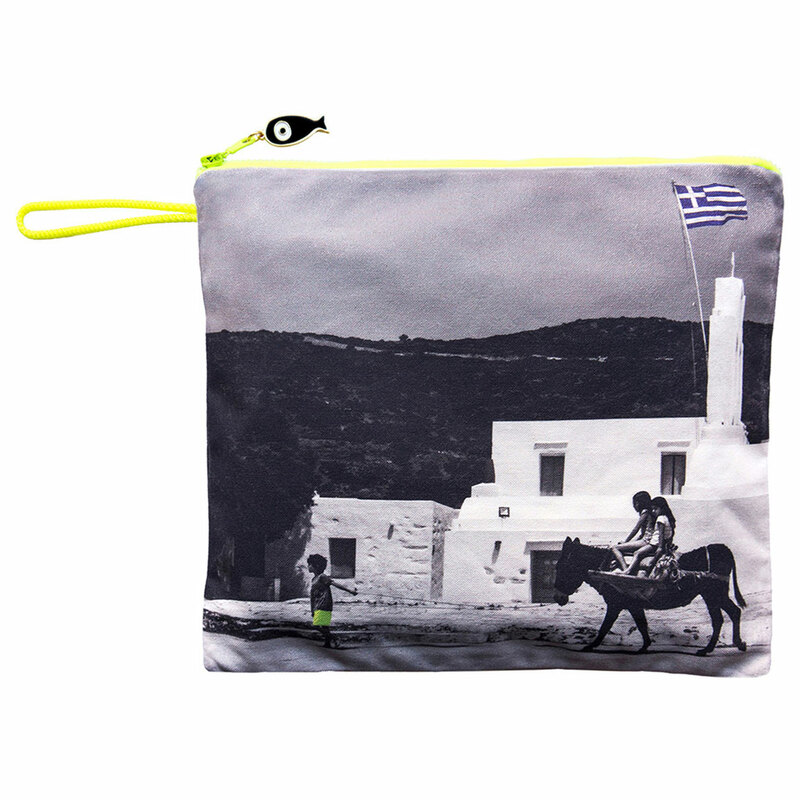 SIFNOS, Waterproof Summer Beach Canvas Pouch. Photo © Marina Vernicos. A snapshot of a Grecian summer is the perfect accessory to any seasonal outfit – which is exactly the case with the waterproof, canvas Sifnos pouch by the brand The Lucky Bag. Created by and featuring evocative images of stunning Greek locales by award-winning photographer, Marina Vernicos, sales from part of the proceeds from this pouch (34 x 30 cm) are donated "with love, luck and hope" to CREAID, a nonprofit that supports underprivileged children living in Greece. Marina founded CREAID in order to give back to her homeland through a targeted humanitarian directive which is served through the melding of art and creativity. With The Lucky Bag label - which asides from pouches, also produces many other items such as silk scarves and tote bags emblazoned with her characteristic, color-saturated images - Marina combines both her photographic and humanitarian work, whilst affording others with an easy way to give back as well. Spectrum collection by Nikos Koulis. Photo © Nikos Koulis. Wearing miniature, sculptural works of art always seems to have a way of making anyone feel absolutely amazing. And this is absolutely the case with the incredible jewelry Spectrum series created by Greek designer Nikos Koulis whose swirls of rotatable, gold beads seem to capture the radiant light waves of the Mediterranean summer sun in their metal sheen and are sure to blind more than a few lustful eyes with their brilliance. Nikos Koulis, who comes from a family of gem wholesalers, followed his passion into the fine art of jewelry craftsmanship. After studies in Gemology and Glyptography at the Gemological Institute of America, he established his eponymous label in 2006. Since then, Nikos has designed and run his own workshop in Athens, where he oversees every stage of production in the creation of his innovative designs reflecting Nikos' exacting eye for unique details, and masterfully blending traditional Greek jewelry craftsmanship with a contemporary flourish. Grilled Octopus by Diane von Furstenberg from 'A Taste of Greece' - Recipes, Cuisine & Culture by HRH Princess Tatiana & Diana Farr Louis, published by teNeues. Photo © Antonios Mitsopoulos. All of the special elements of Greek cuisine are lovingly captured in the cookbook, A Taste of Greece, by HRH Princess Tatiana and Diana Farr Louis. 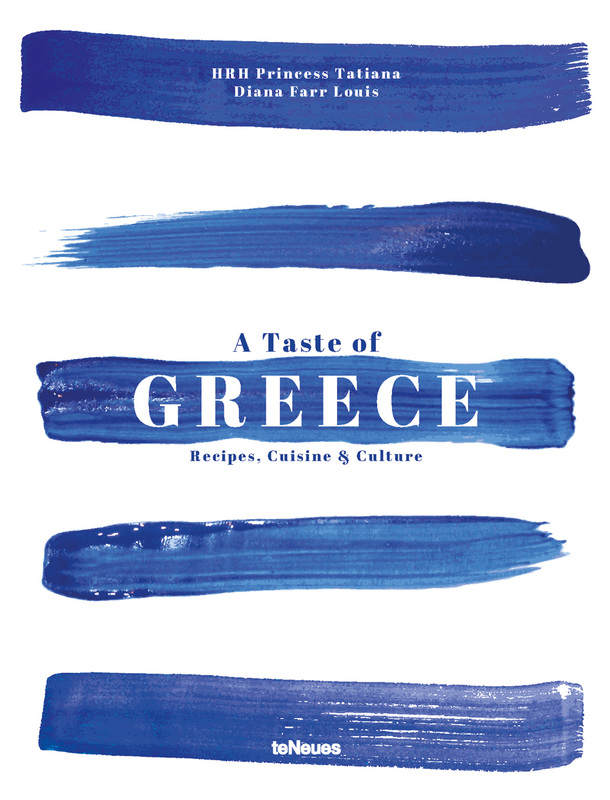 This 208 page, hardcover book, published by TeNeues, is a treasury of favorite, delectable recipes and memories shared by notable personalities - both philhellenes and Greeks— from around the world. Why not try Arianna Huffington's favorite Melomakarona recipe, Diane Von Furstenberg's favorite Grilled Octopus, or Princess Tatiana's "Paxos" Salad at your next dinner party? Just perusing its pages, will make readers feel like they are part of a great feast! The 200 color photographs perfectly capture the essence of Greek hospitality, something which is extended by the book itself as sale proceeds will be donated to the Athens-based NGO, BOROUME, which is devoted to reducing food waste and fighting malnutrition in vulnerable members and groups of society. 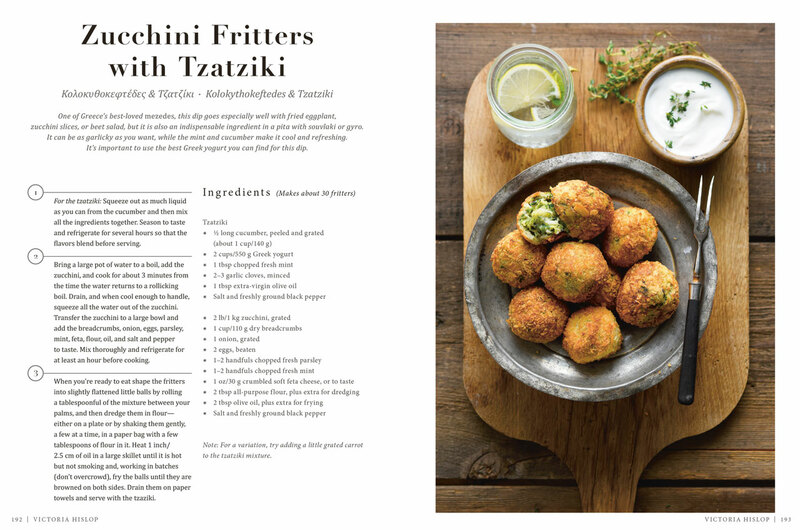 Zucchini Fritters with Tzatziki by novelist Victoria Hislop from 'A Taste of Greece' - Recipes, Cuisine & Culture by HRH Princess Tatiana & Diana Farr Louis, published by teNeues. Photo © Antonios Mitsopoulos. A Taste of Greece - Recipes, Cuisine & Culture by HRH Princess Tatiana & Diana Farr Louis, published by teNeues. Antinoos Set of 2 Bookends. 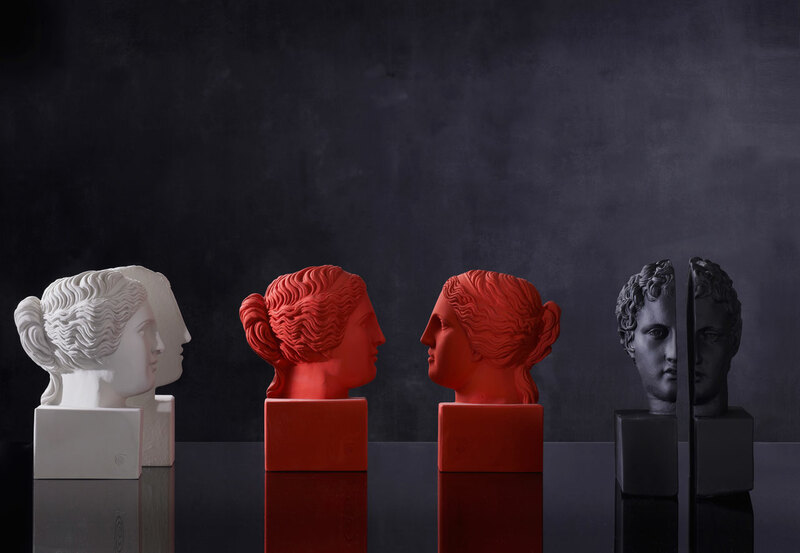 Taking their collection's premise of design that encourages people to "Enjoy Thinking," Greek brand Sophia has created unique sets of award-winning bookends inspired from their bestselling busts. The Antinoos Set of 2 Bookends is the perfect example of ancient-made-modern innovation and inspiration. 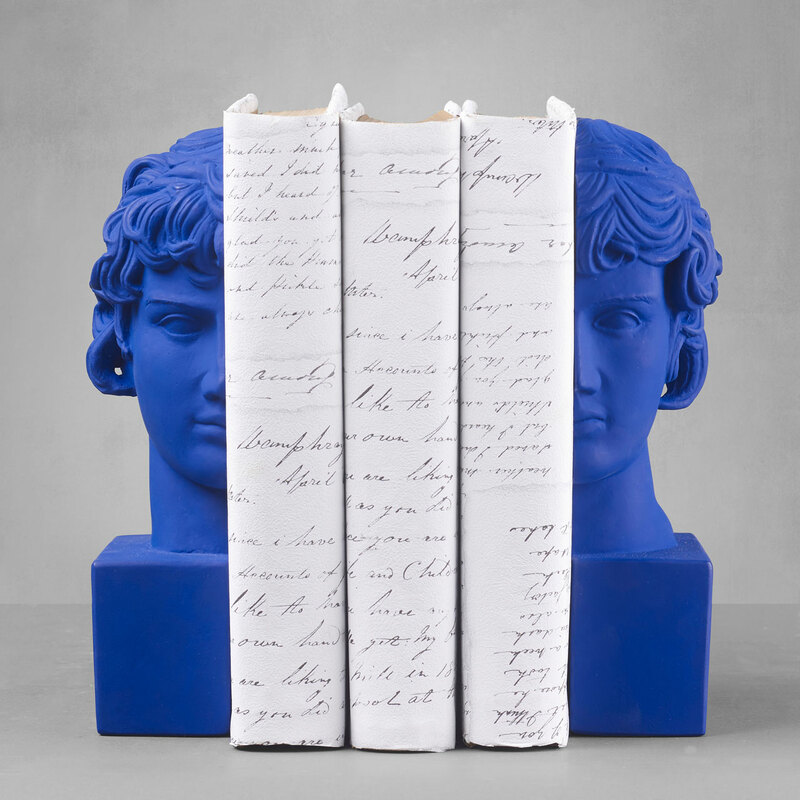 Handcrafted out of ceramine and available in an exclusive and eye-catching Yves Klein Blue color, at 4500 gr in weight these bookends not only do their job… they also make excellent conversation pieces and are an asset to the décor of any room! Sophia - Enjoy Thinking is on a mission to revive the unique storytelling traditions of Greece via ethical trade practices and collaborations. Created in the country and based on Greece's historical concepts of beauty, health, endurance, strength, victory and wisdom, the Enjoy Thinking handmade home accessories collection aims to inspire people to instill those ancient ideals into today's modern lifestyles whilst supporting the development of the arts and artists, in every way, shape and form. What could be more according to the ancient Greek ideals than that? 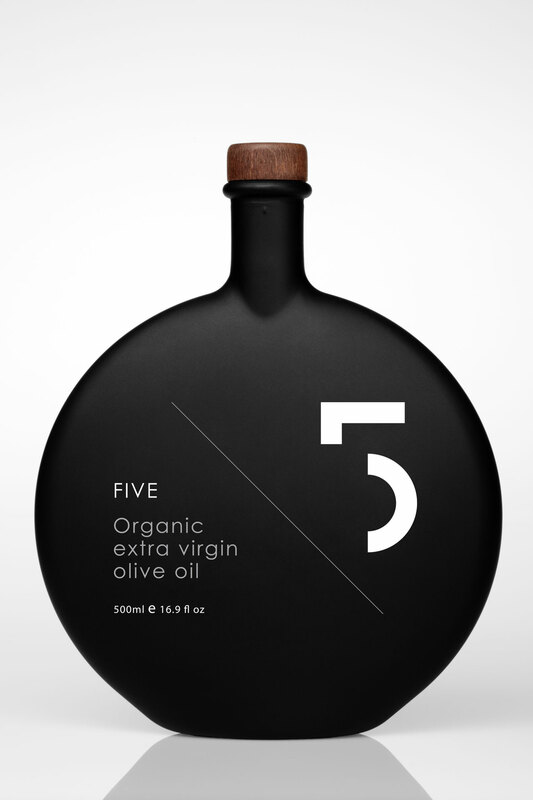 If olive oil can be described as the "national flavor" of Greece, then gourmet brand, 5 Olive Oil by World Excellent Products S.A. is one of its finest specimens. Pressed through the cold extraction process from some of the finest Koroneiki variety olive crops from the Peloponnese in Greece, the oil's balanced fruity taste and low acidity makes it the ideal accompaniment for all Mediterranean cooking needs. WEP S.A. however, has taken it a step further than most other brands, and has distinguished 5 Olive Oil through the use of high caliber design aesthetics: the award winning, elegantly appointed bottles encasing each of the five varieties of olive oil - Extra, Ultra premium, Organic, Unique and Limited edition - as well as the label's exclusive Balsamic estate vinegar, are not only eye-catching but recognizable. Each exhibits a special twist on the characteristic rounded bottle, such as the glass color which ranges from matte black, to white, to clear, to even the glamorous addition of Swarovski crystals. Each unique variation was thought up in collaboration with the award winning design agency, "Designers United," and has received various international design recognitions such as the Reddot Design Awards and the NYIOOC in 2012 and 2013. "Good habits formed at youth make all the difference" Aristotle. What could be better than gifting one's home with a little bit of ancient Greek philosophy and art inspiration? 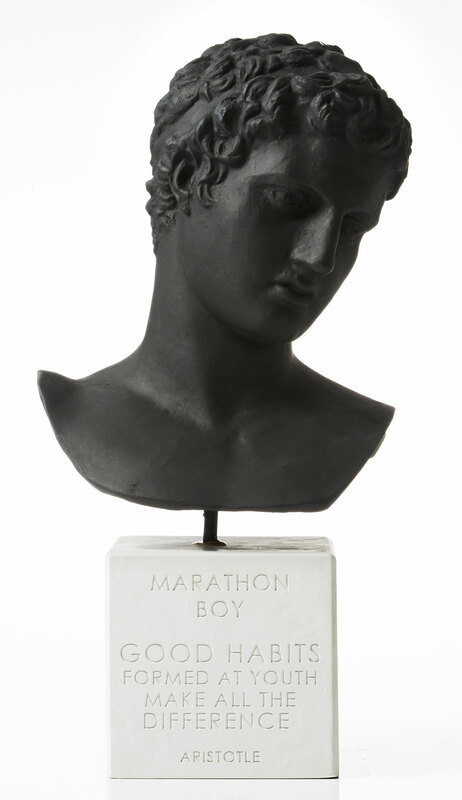 This is exactly what the Marathon Boy bust by Greek label, Sophia - Enjoy Thinking offers! Standing at 45 x 23 x 21 cm, the bust is the perfect size for peeking through the books of a bookcase, displaying on a coffee table or standing proud on a mantle… anywhere, really that needs a special touch. The inscription on the base quotes Aristotle: "The good habits formed at youth make all the difference," and is sure to be an awesome reminder whether one is actually a youth in years… or just a youth at heart! The ancient Greek world's mythological stories and their characters seem to live on in the imaginations of dreamers, even today. For instance, who hasn't heard of Hermes’ winged sandals and envisioned owning a pair themselves? Well, it appears that Hermes' cobbler has come to the modern day world for just that purpose – through the brand Ancient Greek Sandals! The label which was created by Christina Martini and Nikolas Minoglou was an instant hit and continues to make a huge impact on the shoe collections of stylish people worldwide thanks to the timeless designs, skilled artisanship and time-honored, ancient techniques that go into each hand constructed, made-in-Greece pair. With "Spoilt for choice" definitely being an apt term to describe every year’s collection, women, men and children alike get to choose from not only from a multitude of chemical free, naturally tanned colors - which seem to only become better with age - but also from a plethora of styles. One thing is certain: whether flat or wedge soled, thong or lace-up , beaded, braided or cut-out, a pair of Ancient Greek Sandals is a must-have purchase for the summer. Well, that… and a shiny, fresh pedicure! Courtesy of Ancient Greek Sandals. Photo by Yannis Bournias, styling by Manos Jojos. Silk scarf from the series 'I Will Care For You And Nurture Your Soul' by ΣΕΡΑΠΙΣ. Photo © ΣΕΡΑΠΙΣ. A 2014-2015 tanker ship's voyage from Poland to Saudi Arabia which sailed through the Suez Canal proved the inspiration for Greek fashion label, ΣΕΡΑΠΙΣ (Serapis). Today, the daily lives of that same ship's crew members live on in the photos taken aboard the journey which then went on to be printed on the label's high-end garments and accessories. This silk scarf from the "I Will Care For You And Nurture Your Soul" collection depicts the ship itself and when worn seems to transform into an eye-catching, colorful graphic pattern, making it the ideal accessory for any fashion maven searching for a unique, outfit defining item. Athens-based label, Serapis, came into being a year and a half ago as the collective effort of four friends, but has already received an impressive amount of recognition for its uncomplicated designs which are based on innovative twists on ship workers’ gear. 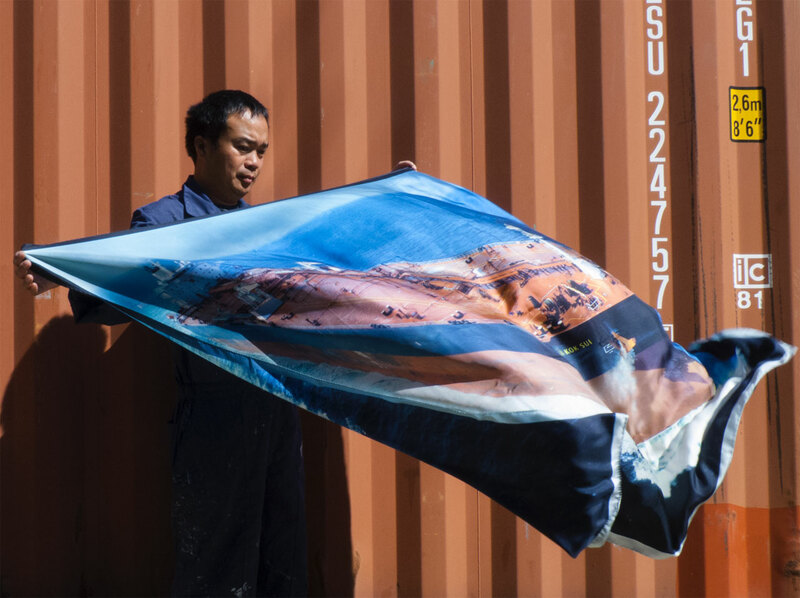 Through the clever fusing of fashion, art and the shipping industry, Serapis' designs are entirely covetable items that are sure to be wonderful ambassadors of the creativity and ingenuity of the label's homegrown talents. Although a day on the beach can do wonders for one's disposition, later on, one's skin will inevitably be in need of some respite, no matter how much sunscreen has been religiously applied throughout the day. To the rescue comes Greek brand Korres’ Cooling After-Sun Face & Body Yoghurt which, in keeping with the brand's natural philosophies, is made with real edible yoghurt (but try not to eat it) and other soothing, natural ingredients such as Fennel extract, making it good for the body “from the outside in” as it relieves and calms sun-drenched skin! 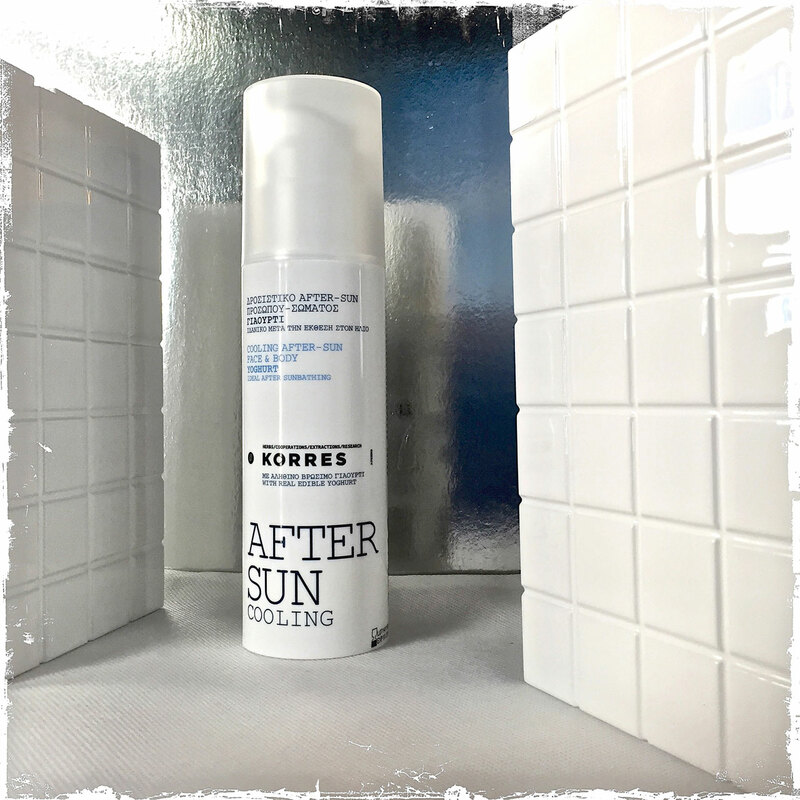 Korres was established in 1996 by George and Lena Korres who were determined to use only natural and/or certified organic ingredients for the production of the highest quality affordable skin care. Although Korres has grown exponentially and is now sold around the world, its production continues to take place in Greece where the company continues to cooperates with local communities, agricultural unions and organic farmers around the country in the research and development of innovative products based on traditional methods. 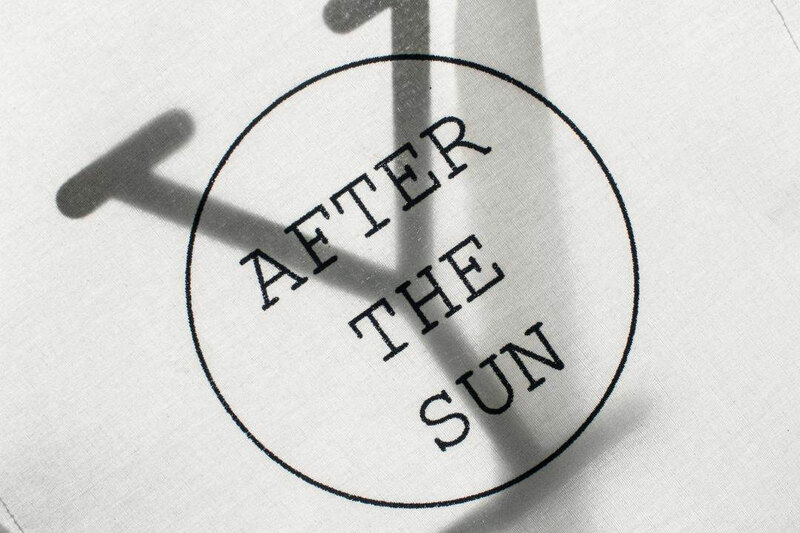 // for US orders click here. Hand-built & hand-written circle ceramic salad bowl from THE PENELOPE tableware collection by TRIA. With summer being the season for sharing relaxed, home-style meals with friends, a Greek salad served from this salad bowl from TRIA etc's Penelope Collection is sure to l make you the quintessential host! 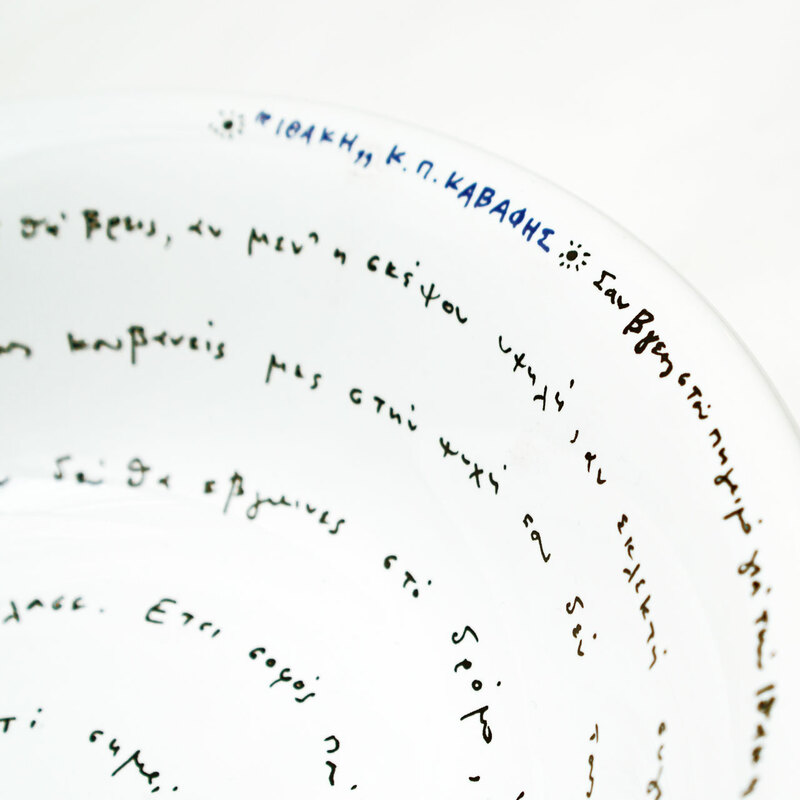 Handmade by renowned potter Kypraiou SA, out of Cretan, faience ceramic, this 28 cm numbered bowl with an off-white background features verses from Constantine Cavafy's poem, "Ithaca," in black and blue lettering drawn by hand by journalist and artist, Thanassis Lalas. Collect the full set of eight plates and you and your guests can read the whole poem accompanied by Sean Connery, whose famous baritone voice recites it in the accompanying CD, set to music by Greek composer, Vangelis Papathanasiou. This incredible salad bowl from the Penelope Collection is just one perfect example of TRIA etc. 's dedication to promoting Greece’s talented artisans: through exclusive collaborations, TRIA etc. introduces these creatives to the international world at large whilst supporting the country’s traditional workmanship methods, helping to preserve them for future generations. Excerpt from Ithaka poem by Constantine P. Cavafy translated by Edmund Keeley/Philip Sherrard. Armathea Beach bag by SALTY BAG. 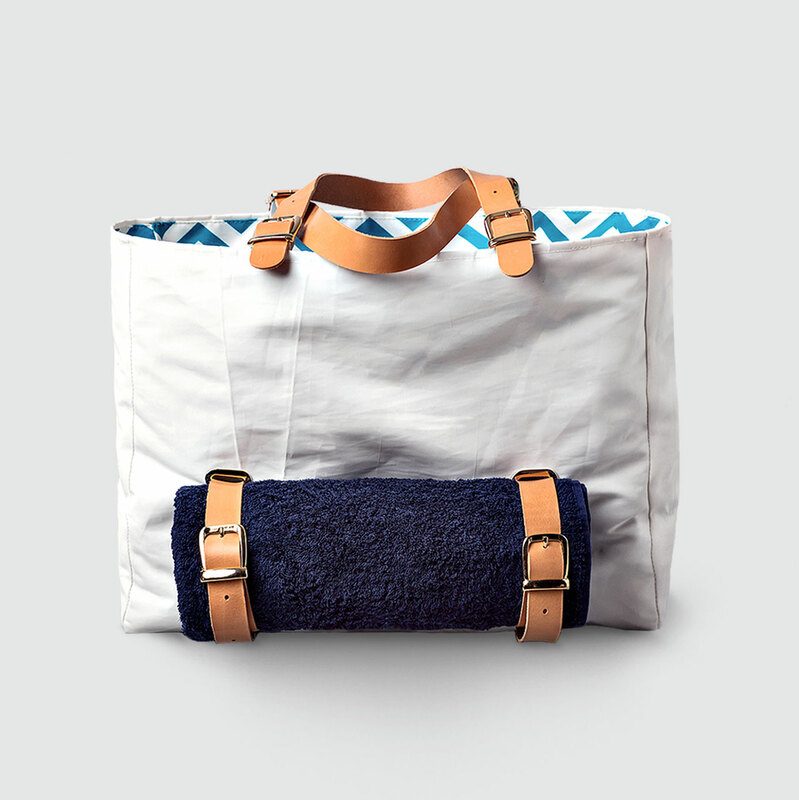 The Armathea Beach Bag by Salty Bag is certainly the best companion for summertime adventures! This handy 37 x 14 x 49 cm bag is entirely handcrafted on the Ionian Greek island of Corfu out of weather-resistant, upcycled polyester sailcloth. Armathea is beautiful on the outside as well as on the inside: not only is its chevron-patterned, Waterproof Teflon-coated lining destined to keep all of your belongings dry within its spacious interior, but the inventive ethically sourced, vegetable tanned, Tuscan leather belt straps on the outside are perfect for stowing your beach towel, keeping your towel both handy to use… and keeping its collected sea salt and sand off of your other belongings on the way home! As the unique story goes, the Salty Bag brand was conceived in 2013 during a Sailing Club Seminar on the island of Corfu where the idea was born to use discarded sails which still had a lot more life left to give. The Salty Bag team now oversees and produces a wide range of bag designs, from totes to duffel bags, all created from these sails. What's more, each bag is unique, bearing the "scars" of the fabrics' past life to tell a story that would have been otherwise untold. Maa Boo swimwear 2016. Photo © Maa Boo. Three years ago, two best friends, Iloi and Anna, were inspired by their dreams of an endless Greek summer and on a whim, decided to do something to turn their dreams into a reality, a vision that also happened to fill a void in the market and soon evolved into Maa Boo, a line of fun, elegant and totally wearable beachwear all entirely designed and made in Iloi and Anna's homeland of Greece. Today, the detail-orientated label is gaining recognition from women from around the world who are drawn to its impeccable craftsmanship and covetable designs. From perfect one-pieces to flirty bikinis, Maa Boo swimsuits' bright prints and demure solids make them a go-to staple that just beg to be thrown into every beach-combing, bohemian-chic-dreaming girl's vacation suitcase. We'll take one in every color, please!